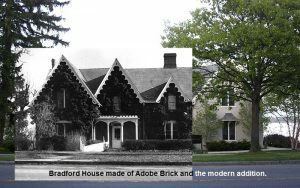 One adobe house in Geneva is Bradford House. Built in 1840, it has been a private residence, two schools, and the home of William Smith Admissions. In 2006 the building was expanded to accommodate both Hobart and William Smith Admissions. One of the new exhibits at the Geneva History Museum is about architecture . I admit to not being very knowledgeable about architecture and its different design features, but one aspect of Geneva’s architecture fascinates me and that’s our adobe houses. Adobe! My first thought is the dessert regions of the southwestern United States. Who decided building houses out of mud and straw brick was a good idea? Anyone who has visited Arizona or New Mexico knows the climate of Upstate New York is nothing like those two states. The information we have doesn’t give a good answer for that, though an interesting answer proposed by J. B. Mulvey, who researched his home’s history, is that Washington Irving may have had a hand in the idea. There are several houses made of adobe in different areas of the city all built within about 10 years of each other. Between 1840 and 1850 homes of mud brick construction were built on Castle Street, Elmwood Place, Lewis Street, Lochland Road, Pre-Emption Road, Pulteney Street, Rose Street, South Main Street and Washington Street. What is Washington Irving’s connection to these houses? Irving was not only an author and essayist, but also Minister to Spain from 1826 to 1829. Not only was he introduced to adobe buildings in Spain, but also when he went on a surveying tour of the western Indian Territories in this country. So where does Geneva come into this experience? Irving had two nephews, Rev. Pierre Parris Irving, who was Rector of Trinity Church in Geneva from 1836 – 1843 and Theodore Irving who taught at Hobart from 1837 to 1847 and had one of the adobe homes on South Main Street built during that time. It is possible that Washington Irving’s exposure to the mud brick construction of the desert climates inspired one or both of his nephews to bring the architecture to Geneva. Research done by Richard Pieper for a paper presented at the annual conference of the Vernacular Architecture Forum in Kingston, New York on May 10, 1986 showed that by the mid-nineteenth century over 40 mud brick structures were spread over a 9 county area of New York State. Ontario County was the epicenter of this architecture having at least twenty-two of the buildings, more than any other county. The Village of Geneva had at least fourteen of the structures within its boundaries. The buildings reflected several styles including Greek Revival, Gothic Revival and Italianate styles. The value of the buildings ranged from $100 to $15,000 according to Pieper’s research of the 1855 New York State census. The majority of the adobe buildings have survived into the 21st century intact. Some have been added onto, some have been wood sided, others remain stucco coated and at least two have been on the Historical Society’s Tour of Homes. Geneva is a city of unique, attractive and historic architecture. Interesting architectural details can be seen on many houses outside of the current Historic District zones. Palladian windows, gingerbread trim, curved glass windows, parquet floors, stained glass windows, carvings, inlay, wrought iron and beautiful wood work are often found in homes of middle class stature. Come visit our beautiful city!